One of the most underused collections at the American Heritage Center has a gold mine of information (some on an actual gold mine) spread across dozens of boxes and hundreds of folders. Titans of industry in the waning Gilded Age are highlighted in correspondence and business contracts, deeds, and minutes. Such men could be staying at a swanky hotel in our nation’s capital while sending and receiving letters from venture capitalists in London, cattle foremen in New Mexico, estate lawyers in Iowa, and desperate hucksters, inventors, and panhandlers from areas in between. Such was the lot of James and Helen Bosler of Carlisle Pennsylvania, and their heir apparent, Frank Bosler. Frank Bosler, along with a few other notables such as Edward Ivinson, would become the closest thing Wyoming had to a Rockefeller or a J.P. Morgan. A level-headed businessman who made decisions by the numbers rather than by personal feelings, ran what amounted to a minor business empire that comprised large tracts of Southeast Wyoming, land and cattle in Iowa and New Mexico, and mine deeds in Colorado. His holdings included a dizzying array of companies that included the Iron Mountain Ranch, the Iron Mountain Alloy Company, and the Ashland Mining Company. Frank Bosler could be found sending letters and contracts that exchanged tens of thousands and hundreds of thousands of dollars, and later, he could send a letter to his bank enquiring about a discrepancy of one dollar and seventy-two cents, making him meticulous, miserly, or both. Photograph of John Coble. Photofile: Coble, John. UW American Heritage Center. Juxtaposed with this gentleman from back East, a tenderfoot some might have called him in his younger years, was the rough and tumble John C. Coble. Coble was the owner of the world famous bucking bronco Steamboat, the horse immortalized as Wyoming’s unofficial symbol. 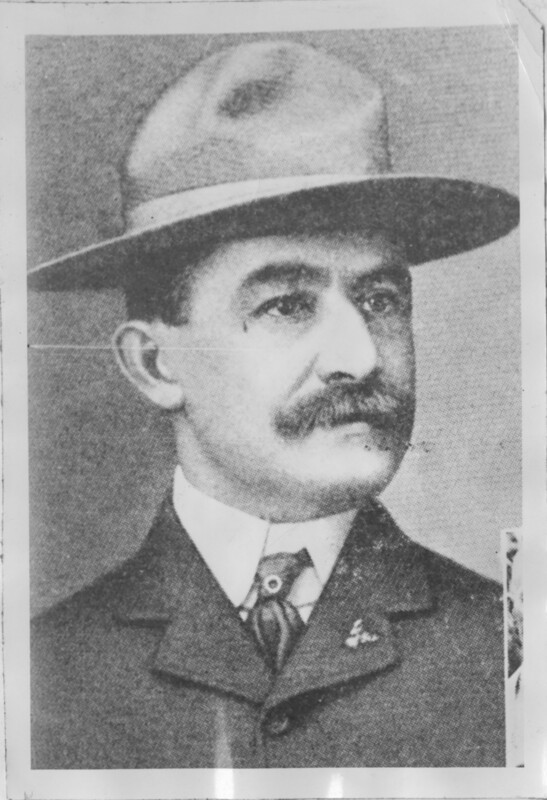 Coble, an undisputed leader of cowpokes and survivor of a grisly knife attack by the father of the boy allegedly murdered by Tom Horn, was Bosler’s business partner and primary operator of the Iron Mountain Company. Bosler, cultured and unemotional, and Coble, hardened cowboy and hothead, made for quite the odd couple. It is no wonder that their business partnership dissolved with Coble allegedly misallocating company funds in order to pay for Horn’s defense, Horn being a close, personal friend. Coble eventually won a civil case Bosler that went all the way to the Wyoming Supreme Court, which held that Bosler owed Coble over twenty thousand dollars in damages! All these events represent a fraction of the interactions found in the Bosler Family Collection that bring to life the changing Wyoming landscape at the turn of the last century. Dig in, and enjoy this precious stone at the AHC in the Gem City of the Plains. This entry was posted in Wyoming history and tagged Archival Methods Course, Student research. Bookmark the permalink. Do you have any information on the location and condition of the Iron Mountain ranch buildings where John Coble lived and where Tom Horn stayed while working for John C? I am aware of a second ranch located on the east side of Iron Mountain that was owned by John Bell in the 1970’s which I visited while leasing grass for Ceres Land & Cattle. Mr. Bell claimed that Tom Horn stayed at this ranch house while working the Chugwater drainage. Thanks ! Interesting question! We’ll have someone look into this for you! The Albany County Ranch Toured this ranch several years ago and the information about the ranch is located at the Albany County Library. I went on that tour and the buidings are in great condition. the highway junction of Highway 395 for a new life as a bar and steak house Norman Brown and his wife, Idele, were opening. It was a great watering hole for the few people in the area for years! Thanks for sharing your memories and for the question. I’ll research this and respond with an answer in the next few weeks! This blog post is about Frank Bosler Sr. (1870-1918). He was married to Hannah Bosler (1882-1944) and they had two children, Frank Bosler Jr. (1916-1993) and James D. Bosler, who died young (I could not locate years for James). I hope that this answers your question. Thanks for reading and commenting! I am doing research on family names, including the Boslers. Is Bosler Way named after Frank Bosler Sr. and/or Jr.? Are there any descendants to Frank C. Bosler Sr. who are still alive? Thank you for your question Matilda. I am not sure if I will be able to answer this question, but I will try my best. I will send my full response to the email address associated with your WordPress account, but I will also post a note here so that you know to look for the response. Please note that it can take 30-60 days for an archivist to research and respond to questions.